The majority of the early calculators were very simple devices offering only basic addition, subtraction, multiplication and division. Bill Hewlett, of Hewlett Packard, revolutionised the world of pocket calculators in 1972, when he introduced the HP-35 Scientific calculator. A brave design decision for very early technology was to craft the electronics to match Bill Hewlett's original sketch of how the keyboard should look. The basic functions were in the lower half of the keyboard, with the scientific functions above. This became the definitive layout for the scientific calculator. The HP-35 also used Reverse Polish Logic (RPN): you entered the numbers you wanted to compute, then the operation - A [enter] B [+], rather then A + B =. This gave the Hewlett Packard calculator a certain scientific kudos. Equally innovative, Clive Sinclair, of Sinclair Radionics, launched the Sinclair Executive in 1972. 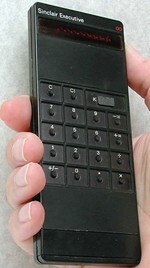 It originally cost 79 [around 700 in today's money] and was the smallest and lightest calculator on the market. Whilst it used the TI chip common to most calculators, Clive Sinclair worked out a way of operating the chip on less power, basically only powering the chip when calculations were being done. The Sinclair Executive could operate from four tiny hearing aid batteries, allowing its ultra slim profile. Executive was a good choice for the model name. The calculator was now a symbol of prestige to the business man. The executive taking a calculator out of his brief case on a flight was becoming common by 1974. The calculator enabled businessmen to quickly work out sales figures or margins whilst on the move. Hewlett Packard introduced a specific model for the business man, the HP-80. The HP-80 could work out bond yields and net present values at the push of a button. It was invaluable to business decision making. With intense competition, prices of pocket calculators dropped rapidly in the 70s. 1975 was a turning point; everyone wanted a calculator for Christmas. That year calculator sales boomed. Dixon's was Britain's leading retailer of pocket calculators. In 1975 their Prinztronic range captured over 50% of the UK market, with sales of 1.2 million calculators. The basic Prinztronic from Dixon's cost 6.95 [40 in today's money]. The pocket calculator, initially a curiosity, then a status symbol, became everyone's favourite gadget. Now housewives were buying them to add up the weekly shopping bill and children were buying them to assist with their homework. Calculators were already being permitted in university and college exams, but their use at school was still controversial. At what point could it be assumed that the pupils had learned enough maths to be able to do sums without the need of a calculator? This debate raged well into the 80s, when they were still not permitted in many examinations and use was still discouraged in schools. The next step in the development of the pocket calculator was the replacement of the old LED displays with LCD (liquid crystal display). The now familiar black numbers on a grey background meant smaller power consumption and smaller dimensions. The LCD display allowed credit card sized calculators. At the end of the seventies, the new status symbol was a calculator as small as a credit card. By the early 80s, these were common place and very cheap.